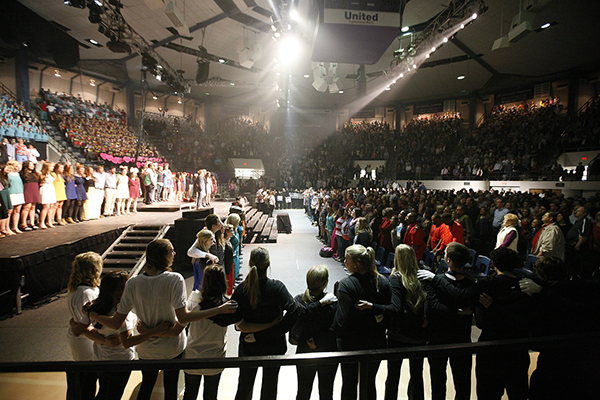 When nearly 5,000 people raise their a cappella voices in song with the first chords of The Lord Bless You and Keep You, an ethereal exclamation point punctuates the conclusion of each Sing Song show in Moody Coliseum. “Everybody singing The Lord Bless You and Keep You at the end of Sing Song is one of our greatest traditions,” said Dr. Robert D. “Bob” Hunter (’52), vice president emeritus and founder, creator and former director of ACU Sing Song. “I feel like I’ve just experienced a taste of what heaven will be like” is often heard among guests, he said. “It is unforgettable,” McCaleb said. “In its truest sense, the finale is a celebration of community.” And experiencing that tangible manifestation of community deepens the understanding of what students experience at ACU – an experience that continues beyond their years as a student. 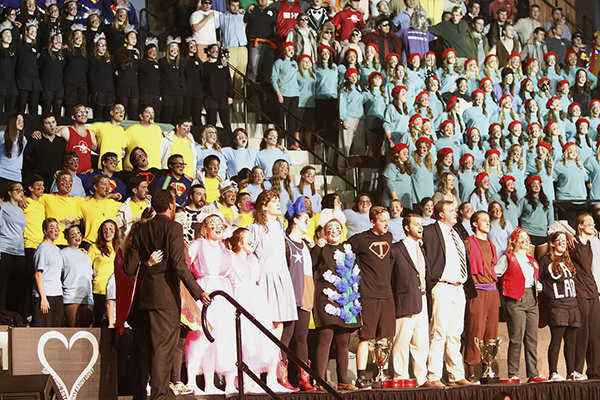 “Getting everybody back on campus for Sing Song is a thrilling thing,” Hunter said. In recent years, Sing Song has offered four shows: a Thursday night preview and performances on Friday night, Saturday afternoon and Saturday night. About 75 percent of the 9,000 guests who watch the event each year are alumni. Reunions are now driven in part by some of the Sing Song processes. Thirty judges are utilized throughout the group evaluation process during any one year, and alumni who were actively involved in the Sing Song process 10, 20 and 30 years ago are some of the first to receive invitations to serve as judges. Along with a large alumni demographic in the audience, Hunter said Sing Song is a great opportunity to bring guests to ACU, especially prospective students. But while the audience experience is great, the student one surpasses it. In 1956, I saw the first Sing Song in Sewell Auditorium, my uncle’s namesake. It was great. The stage held a little over 20 singers. I’d like a return visit.